The Braided Barrel Rein is comprise of four easy grip knots and brass plated hardware. I had a red pair for my one horse and its perfect and easily adjusted to the length I needed so I decided to order a blue set for my new horse. Works great!! This is Docs Dun N Chrome sporting the Blue/Black reins I purchased. Hang on!!! You’ll love these!! The price was awesome so I bought three sets, one for each grand-kid who ride my horse in play-days. I added the clips for an easy change out since they use the same horse. Don't know about durability since I just received them, but the kids are thrilled with their own unique reins and scored grandma some points! I just received these reins in the mail today. First impression was that they are really soft so that means hopefully no rope burns when riding without gloves. They are also really secure from what I can see and they seem to be long enough so they aren't too long and not too short. They color I purchased was the blue/lime green and the color is nice and bright. I cannot wait to try these out. I love these! We add clips for quick changes and they are easy to switch bridles, lengthen or shorten for multiple riders, and last forever. You can't beat the quality for the price! Absolutely love these reins!!!! The colors are so pretty & vibrant! They r great for anything really... I use them for gymkhana, rodeo, trai riding & jumping and they hold up great!!! I have pink , pink purple blue mix, and black and tan . if they get dirty u can put them in the washer and they look brand new!!!! I don't know what other people r talking about though because u can adjust them to the perfect length!!! Love these and highly recommend!!!! I read the reviews prior to purchasing and I was nervous about it them being short but I decided to take the risk. I haven't measured it (full disclosure) but I'm actually finding them to be a bit longer than I needed. When they first arrived I was constantly having to hop off and shorten the reins on my 15hh QH. He may just have a short neck compared to some but I felt the length was just fine. Used it in my barrel race last Saturday and they worked very well. I wish they were a little thicker but that's just being picky. Can't beat the price! I bought these reins a while back from here after seeing my friends reins and I knew I just had to have them. They worked great on the Arab I was riding, but when it came to my Fjord, they were way too short!. After looking online for new reins, I realized the site said they were 8 feet long, while the reins I really like were only 7 feet long, so I got out the tape measure and these are definitely not 8 feet, they are 6 1/2 feet and shockingly the reins I really like were 1/2 feet longer than stated. So, if you're looking for 6 1/2 feet reins, then these are the reins for you. This rein was beautiful to look at, strong, and very well made. Great colors and fairly well made. Very comfortable on my hands. Just what the kids asked for. I bought the black/tan ones for my Arabian for trail riding. At first I was worried about them not staying attached to the bit when under stress, but they work great! They've never come unattached, they feel great, and are super durable. I have 3 pairs of these reins in purple & black, lime green & black and hot pink and black. I use them for barrel racing, trail riding, and endurance racing and they are just the best reins ever! Colors are bright and they stay nice and bright I've had my purple pair for about 5 years and I still use them to this day! They are great quality for the price and so durable! I did a whole new set, pink pink and more pink. These reins looked great and work wonderfully! does anyone have the teal and black ones? These are the best gaming reins. I've had mine for a long time now and they hold up extremely well! I don't recommend any OTHER gaming rein. I have purple and green ones and they look amazing with my black bridle. I can't wait to use some new ones at a jackpot! I have about 8 pairs myself, I just love these.. I make my friends buy them too! They are the nicest reins ever. I do not run a pattern without them. Also Love the fact they come in a wide range of colors!~I have the red, white and black, red and black, blue and green, pink and green, blue and black, and orange &black. Love them!! !don't hesitate, its worth it! These are the only reins I will use while running barrels! I just love them! Plus, they come in fun colors and are very affordable! Great Reins, more than gaming use! I bought these reins for the intentions of pleasure riding because I needed a shorter looped rein for my western bridle. I'm training my new horse to keep his head up for English riding and my English reins were too long. They work well for when my barn does barrels for fun, and they helped me keep my horses head up. He was western all his life, but I'm trying to get him English as well and these helped keep things familiar for him and for his training! What a bargain! I got these reins when they were $16 and I luved them! The colors are really bright and these are great presents for horse people. These reins are truly amazing. I love when I barrel race I keep them up to the knots, and when friends ride they can be adjusted to be longer. Also, I have a 19.3hh horse, and they are still long enough for him!!! They are truly amazing. I would reccomend to EVERYONE! I bought these because our daughter has never ridden and we figured this would be easier. They are a lot longer than expected which is wonderful! Our horse is quite large at 17h, we use draft size for the bridles, etc and these are perfect! Bought two sets, the colors are gorgeous. Will be buying more in the future. I really love these reins, the colors are great and the price is great, much cheaper than the exact same reins in other stores. I would highly recomend these. I had always ridden in split reins, but tried a pair of these after seeing how well they worked for a young trainer on my mare. She can be excitable and assertive (shall we say) and I have not dropped these reins in her shenanigans all year. Granted I ride with them just about as long as they go, but I really love them - and plan to buy more. I also added clips to the end so I can ride our gelding with them just as easily. I've always used leather split reins with my tack but I after about 3 years of not being able to ride my horse, I thought I would try these out especially since my horse doesn't neck rein very well. I finally got to ride him about a month ago with these reins and was great! I added some snaps on the ends so I can switch them out on my other headstalls. They are a bit shorter than what I'm use to but they are very comfortable. I got these for my exiteable arabian. The braided pattern looks really nice, no stretch at all and are easliy adjusted, colors never fade, i just wish there were different snaps on the end but you can always change them out for different ones, overall i'm very impressed with these. I got these in black & I really like them. I like that they're a little longer, so I can adjust them to riding at home or at the race. My only complaint is those conway buckles. Why won't anybody put BRASS buckles & snaps on anything anymore?? Geesh. I mean I know I paid next to nothing for these reins, but I'd rather they came with no buckles as what's on there. I've used them at one race & rode with them twice at home & I'm already about to order new buckles. BUT - as I said before, I really do like the reins themselves. I am in love with these reins! The pink and black ones match all of my tack. And they're really sturdy and fairly inexpensive for the quality. I highly recommend these. i have 3 pairs of theses and had them for just about a year and i love them i want the lime/blue ones love this product! will buy more! These reins are the best I had got a hot pink/red color and I have had them for over a year now. They are good if you want long lasting reins for your horse. Mostly best for trail riding. This is a really great rein. It is the perfect length for my 14.2 hand Arabian. It is sturdy and the knots give you a really good grip. I would recomend this rein to anybody! My friend bought these for her barrel horse and they both love them. She highly rrecomended them, so I bought a pair. The blue/green ones match my nylon tack perfectly. They are perfect for barrels, or even just trail rides. The knots are in the perfect place for holding. Me, my brother, my grandma, and my cousins love these reins! I love these!!!!!!! they are so pretty!!!!!!!! These reins are awesome! I love them. I got the blue and green set and have been very happy with them. The only problem I have had with them is one side came undone at the end of a practice run i was doing. so you need to just make sure there on good before you run. But when they get dirty just take the metal parts off and throw in the wash! My daughter loves this color combo! I teach riding lessons and having the knots on reins helps my students keep their hands even. Love the single rein and the color. 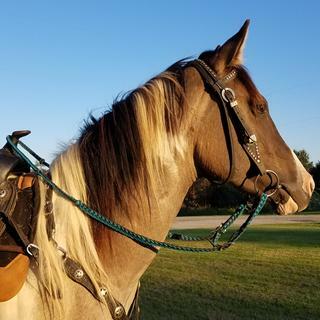 these are some really good barrel reins I have used them for years and love them, they hold up great and I know several others who use them also.. Wanted an extra set (purchased 3). The grand kids love them for their play days. They each have their own color. Love these so much they are the best reins ever!!! Have a set of these and we love them. Needed an extra set and a set for my granddaughter for Christmas. these reins are amazing!!! I have used them many times before the actual purchase and have bee happy with them every time, and I can't wait to use my own pair. Good price, good reviews, needed this type of product to attach to halter for riding out in the pasture and on trails. We'll see how it does. My daughter likes her friends reins so she tried them and liked the way they felt and her friend got them at the same site. Easy for kids to use; they wont drop the reins so easily. There are two different products in the pictures. In the first pic the reins have knots and a round braid in the middle, but the other pictures show reins that are completely flat all the way with no knots. Which picture does the actual product look like? I am interested in the purple ones but I want to know what they look like. BEST ANSWER: My daughter has the blue/green ones and the are round in the middle with the knots. Not flat the entire length. Why does it show multiple colors like purple but only gives you options for just a couple of the colors? BEST ANSWER: Usually the options given are for colors that are currently in stock. Some other color options pictured are temporarily sold out. Could I use this product for trail riding and not just barrels?? Sure! If you like short reins for trail riding... my daughter even uses hers for her lessons. they are nice reins. We bought 2 clips for quick and easy switches... instead of using the buckle all the time. You can use these reins for anything and everything! They're very comfortable and easy to adjust to the length of your choice; longer or shorter. These are the only reins I ever use anymore, GREAT product. ?? Yes, you can use these reins for trail riding. The knots in the rein provide an easy grip for riding and they're a nice length as well. You could. Depending on the length of your horses neck you might find that they are too short to comfortably ride on a trail ride. I use them for both I lengthen them for Trail rides and Shorten them for barrel racing works perfect! Yes, I do. I prefer to add a snap to one end of the reins. Yes, they should work just fine for trail riding. Hi , yes you can use this for trail riding. Yes you could use it for that. Is the green lime or kelly? BEST ANSWER: I bought the Turquoise/Black reins... I have no idea if the green is Kelly or Lime... Sorry. The green that I purchased was lime green. Hope this helps? can these reins attach to a bosel? I don't think so. There are buckles at the ends for attachment to a bit, and they're petty short for gaming. Don't think you've got enough to attach to a bosal. We attach trigger snaps to the end of the reins and then put them on a bosal. Then you can swap reins easily. BEST ANSWER: I added swivel hooks to the reins so that I could change them out easily since the reins I purchased were for my granddaughter and she doesn't ride often. There are Conway buckles on the ends, you just take the end of the reins out of the buckle, loop it around the bit, and buckle it back up. BEST ANSWER: Item Size Flat Â¾â€ x 8'.